So, that being said, I know you will want to hear all about how my writing day went yesterday. You may develop doubts but knitting does get involved here - this is me we're talking about, after all. Sit down at freshly-running computer to write down the piece that started unwinding itself in my head around 11pm the night before. About a page in, realize that I have forgotten all the character names for the stories of which this new one is to be a part (it has after all been three years - how time flies! I thought it was two - and also, I am chronically remembering everything about people except their names, even in person, which is SO distressing); decide to revisit the earlier pieces for refresher. Have saved latest edits of all six previous pieces in one new folder and am about to open them. Back from the posh grocer's, having acquired many and varied healthy, brain-boosting foods I can grab without prep, and am sitting at my desk again. With a rainbow of purse-sized chocolates spread out in front of me and Spider Solitaire back on the screen. Still playing Spider Solitaire but thinking seriously about having a nap. Super loud knocking at door = delivery of some sort. And now you know why I love to shop online: built-in procrastination opportunities! Have just paid $50 in customs fees for delivery from US. Don't ask, I'll explain in due time. Definitely need the nap, but must at least print the stories to get the names out. Compile all six into one document with narrow margins and columns to save paper, then print. Check printout and realize the first story - several years older than the rest - really doesn't fit and must be tossed. Dutifully cut those pages into notepaper and ignore reading the rest. You have GOT to be kidding. Already??? Guh. Up and scrounging in kitchen for travel accessories, since I am about to leave for a/ errands then b/ knitting date with Trish. Reach for portable socks, then think: portable socklets instead? It is after all hot out, and I do need them first, but they are much closer to being finished. Decide to gamble and shove them in purse. Knitting on subway in new train. If you live in Toronto, and you disagree with me, please be kind: I strongly dislike the new subway trains. I couldn't wait for them to be released they look so beautiful from the outside, and I have tried and tried to love them since they were, but my love has steadily diminished over time until now, when I have moved past even 'dislike'. They may take more passengers than the old trains but they accommodate them in infinitely greater discomfort. After about 4 stops I have finally been able to grab one of the tiny narrow seats, go me. Errands complete, arrive at Trish's, where she is putting chairs out so we can knit in the lovely warm shade of her porch. We are both knitting socks even though she is still not loving hers, and chatting about the day. One of us mentions 'parcel' and I say, "I had a parcel today that cost me $50 in customs charges" and she is horrified. Really the questions go on for quite a long time before she twigs that customs charges are directly connected to the dollar value of the merchandise shipped. "Wait a minute," she says finally, "Just how much did you buy from Twisted???" 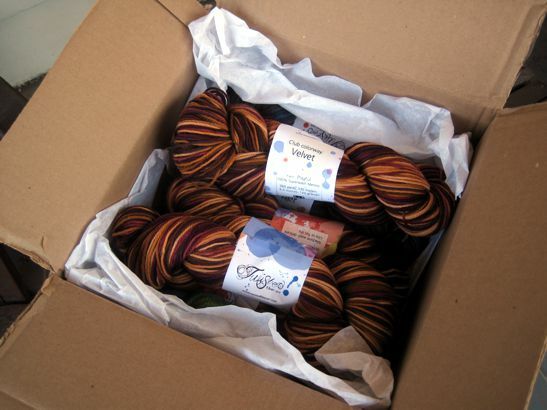 This box of 8 skeins plus 1 bump of roving is the reason I still haven't posted the piece I started writing for Hugs a while ago, called "How To Keep Your Stash Under Control." And the worst is - I planned this particular purchase very carefully for two weeks, right down to the projects, and can't for the life of me remember what they were let alone find my notes on same. I have finished my socklet. I have nothing left to knit! I must now just sit and enjoy the breeze and the conversation and not beat myself up for packing the wrong sock. Or for maybe having messed up the size of the socklet and not having the fortitude to spend this peaceful time ripping it out. Writing up proposal for sewing tutorial I suddenly realize I can't live without doing. ... and back to Spider Solitaire. Now I remember why I stopped writing to knit: with knitting, you have something to show for your time. And isn't that a great gift? Have a wonderful weekend - see you back here sometime around Sunday! Love it! This could be any number of my days, if you substitute Pittsburgh Port Authority buses for Toronto subways. :) I think it's no coincidence I took up knitting in a serious way while writing my manuscript for my MFA. I LOVE spider solitaire! I believe we all have days like this! I hope you are enjoying your twisted sister yarn! Please note - the 'how much did you buy' question was asked out of straight jealousy, not a whiff of censure there. I'm still trying to justify joining Indigodragonfly's monthly club, even though I'm really, really not loving my sock process. I want to get yarny packages in the mail!